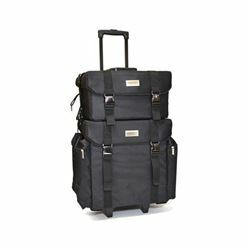 The MST-245 Small Set Bag is designed to carry all the professional makeup artist and hair stylist tools while on set. The clear design makes for fast and easy accessibility. Whether it's being stored away on a shelf or traveling from one location to another, this bag keeps your products and tools tidy, organized and ready to go while you're on set or on location. A convenient tissue box pocket is located on the front of the set bag, with adjustable shoulder strap makes this an ideal set bag. Durable and easy to clean. 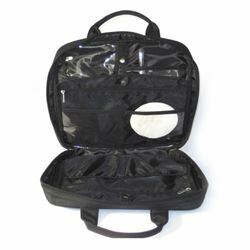 Whether it's being stored away on a shelf or traveling from one location to another, this bag will keep your products and tools tidy, organized and ready to go while you're on the set or on location. 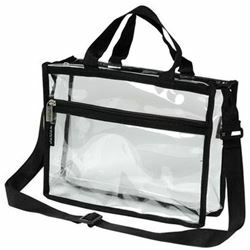 This bag has five clear pockets on one side and two mesh on the other. Great for brushes and combs. Durable and easy to clean. 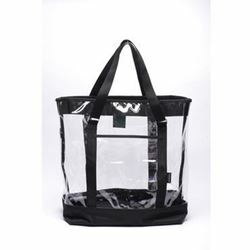 Depending on your own organizing needs and personal taste, this clear bag is great for a variety of uses. 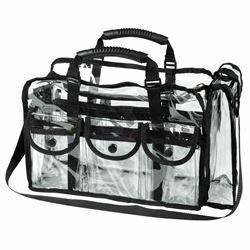 Depending on your own organizing needs and personal taste, this clear bag is great for a variety of uses. 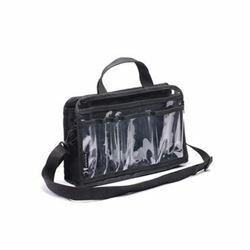 A clear shoulder bag that features an adjustable thick black shoulder strap and two handle straps allowing for easy portability of your favorite products, tools and personal items. 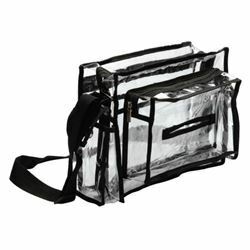 Popular for use on set, this small clear bag packs a punch for its size and even offers an easily accessible outside zipper pocket. 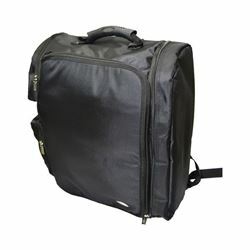 This bag gives a clear 360 degree view of the contents inside, letting you quickly identify what you are looking for. 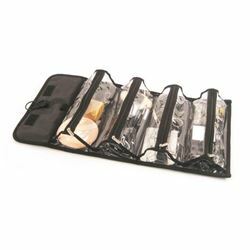 Monda bags have been renowned as one of the best organizing tools by top makeup artists as well as cosmetic junkies alike. 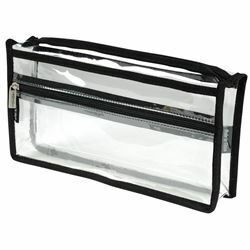 This makeup organizer features four clear roomy zippered pockets and a hook on top for hanging. 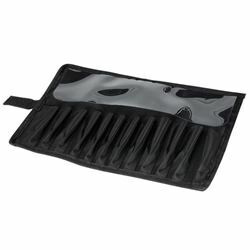 Easy to clean and a great bag for traveling. 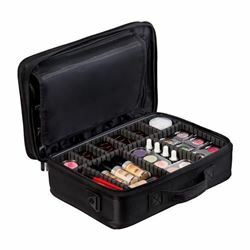 This Travel Case is ideal for artist on the go because of its many storing options. 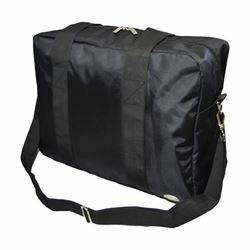 Possibilities are endless with this easy to carry and travel ready bag. Conveniently store all your tools and keep everything organized and easy to access. Whether it's being stored away on a shelf or traveling from one place to another you can count on this bag to carry all your tools, accessories and any personal belongings. Strong, durable handle, and easy to clean. 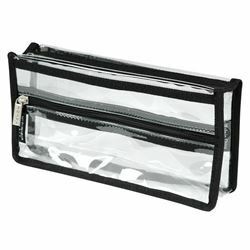 This new and improved Beauty Organizer is a Makeup artist favorite for its larger interior, mesh pockets, and brush organizer. Ideal for personal and professional use at home, on the set, or on the go. 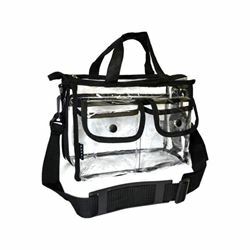 Durable fabrics ensure durability and easy cleaning. Monda Studio's Pro Stack case offers a wide range of storage options for organizing your makeup, brushes, palettes, tools and other accessories. The top case has a 5.25" deep storage space along with brush holder. 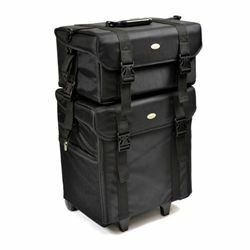 The bottom case has a 3.75" deep storage space on the top and 8 drawers with dimensions of 10.5x7.25x2.5" each. This Versatile Multifunctional Case Is A Hairstylist Favorite. Deep Storage To Fit All Your Tools On The Go. Deep Well Is Heat Resistant Styling Tool Holders With 6 Wide Brush Holders. 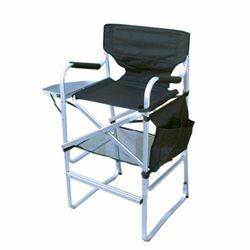 Designed specifically for makeup artists, this director chair stays upright and comes complete with a side table on one side and several pouches on the other making it perfect for storing all your tools. 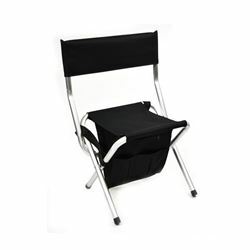 Lightweight and durable, this chair can be folded and easily carried from one location to another. Ideal for traveling, this folding chair's compact size and convenient shoulder strap are perfect for on the go makeup artists. A zippered pouch and three outside pouches help create maximum storage while its strong build ensures durability and comfort.